It does happen. And I know perhaps I go on about it, but I need to express my joy. Isn't that so much better than expressing negativity, showing irritation, or ranting about things? However, I do admit I do all three. . . hopefully just not very often! Those who know me know how deeply I love yoga. I gave a Yin yoga class last Saturday for the 'hood once again on our beach in celebration of the Summer Solstice. Once again this year, it was pure serenity, magical, in that the lake was gently lapping, the birds were calling and flitting around, and two butterflies even came down to flutter amongst the yogis, who were unaware, as their eyes were closed. The sun came out halfway through the hour-long practice. Prior to the gathering, one of the neighbours asked me if I would be open to having the Tibetan prayer flags she and her husband had bought from monks when they were on a retreat near Algonquin. These prayer flags had been blessed by the monks, and so it was with reverence that I said most certainly, yes. We used a shepherd hook from our garden and a piece of rebar from my husband's garage from which to suspend them. Sorry it's not the best quality, as I took it with my phone. The flags encircled us with love and healing and good chi. that about 10 years ago, although I did not know it at the time, there was one particular catalyst for a huge change in my life. One of my dear friends found out that the cancer she had been fighting had spread; it was basically everywhere, and she'd been given just 2 months to live. It was heartbreaking. I made her a quilt, with some help from another friend, as well as donations from several staff members to help cover the cost of the materials. That was the first quilt I had made with such incredible vibrations as I sewed; it was almost tangible. I don't have a picture of it, but I do know that it is well-loved. IS. Ten years later, she lives on, vibrant, full of humour and wisdom, she has an incredible depth of empathy, love; in short she is a testament to the power and positivity of the human spirit. The all-too-real possibility of losing someone close to me made me really stop. And think. Think about the fragility of this life, acknowledge the importance of living each day in the best way one can, revel in the beauty in every single place on this planet, appreciate loved ones. Would that I succeed in these areas every day. However, I do keep trying. 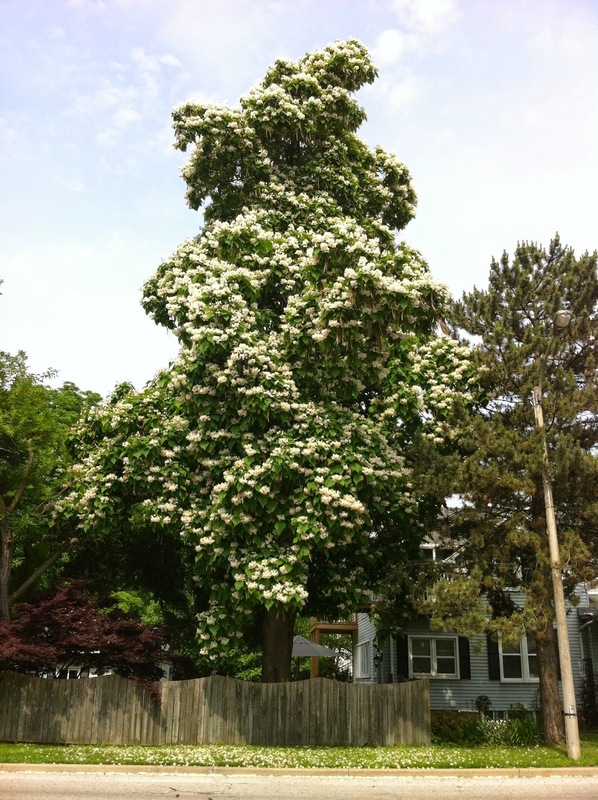 A Catalpa tree in full bloom - that is a 2-storey house it towers over! And so I just wanted to express my love, gratitude, and appreciation for her, my happiness that even though physically, we are far apart, she has enriched my life in so many ways, yoga not the least of them. And that brings me full circle to that hour of serenity sharing yoga on the beach last Saturday for which I am so thankful. I am living my dream. On so many levels. And I am eternally, forever and ever, so very grateful. Note: I have NO idea what gremlins caused the font to change! And even though I highlight and click "default font" it won't go to my regular font. 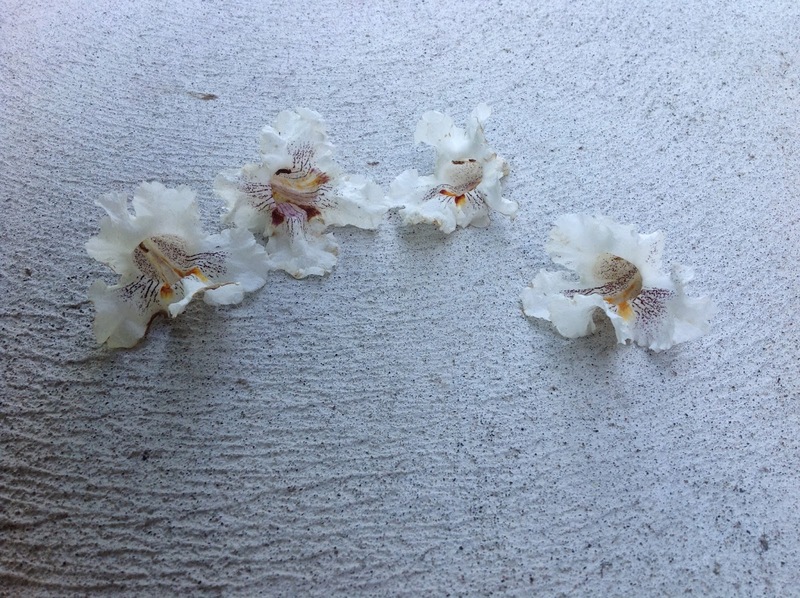 . .
A thoughtful post and great photographs. I did yoga years ago, not for long, but I have thought about going back to it. By the way, I like the new font! Omg that TREE is GORGEOUS!!!! Does it have scented blossoms? Methinks it would be overpowering if it did as there's so MANY blossoms! Yes, humble gratitude for all our blessings.